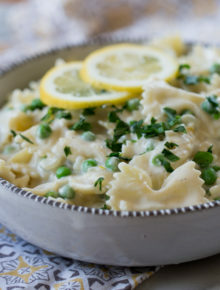 Luxuriously creamy pasta with a lemony twist and a simple list of ingredients. Love how quickly this velvety pasta comes together! Just add a bit of ham for the carnivores. Easter weekend was a whirlwind for us, and as much as the beginning of the week is a bit of a letdown after a fun weekend, it’s also nice to get back into the normal swing of things. Plus, after a good dose of much-needed sun over the wekeend, I’m starting to get reallllly excited for summer. (Resisting urge to insert several different smiley-faced emojis here). And what flavor screams bright, sunny, summer? Lemon! Actually, lemon seems sort of springy to me. So basically, it totally works right here, right now. 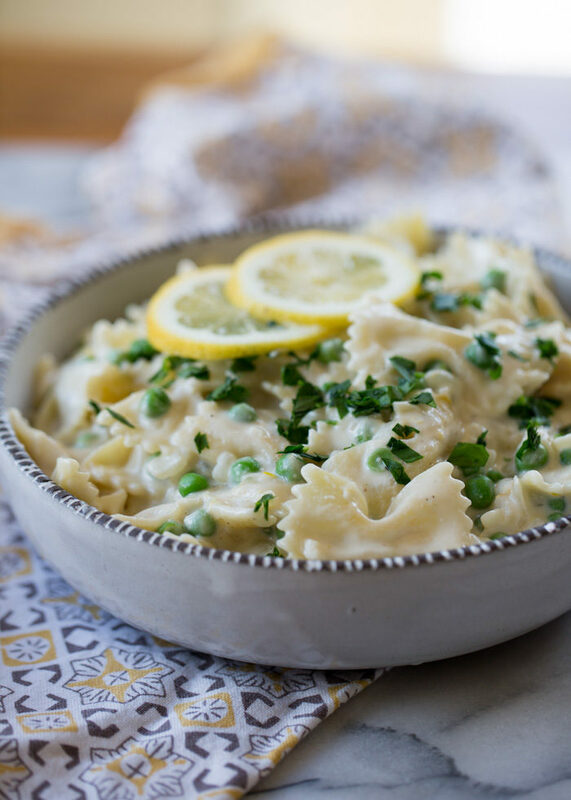 This recipe is a spin-off of my other creamy lemon pasta recipe, one that I shared many years ago, one I have been craving since I went off dairy. The first recipe made use of heavy whipping cream and Parm – no bueno! So I worked on tweaking this recipe to be vegan friendly and I’ve gotta say, I like it waaaayyyy better this way than I did the original version. For real. If you’re not familiar with cashew cream, you might find it hard to believe that the nuts on the left can be soaked then blended with a bit of water and end up looking like the creamy goodness on the right. It’s true, and it’s spectacular! 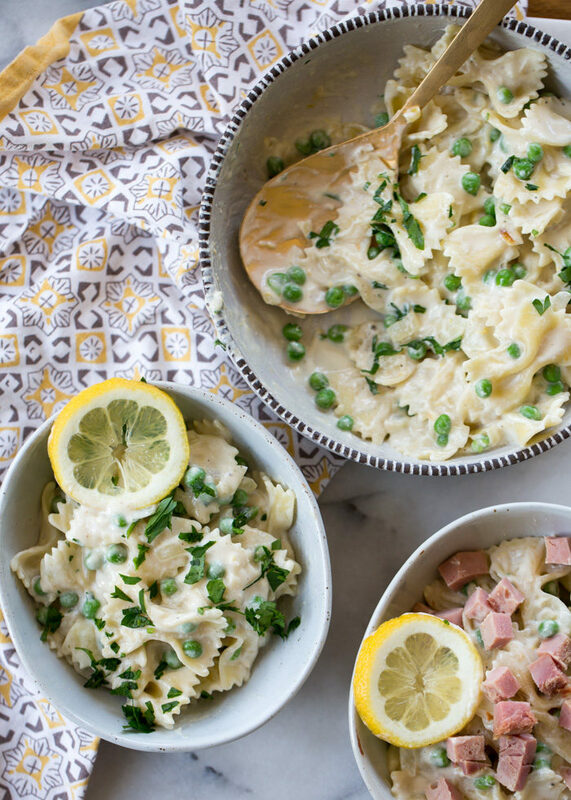 I thought this recipe would be perfect for right after Easter, because leftover ham is often a part of Easter for the carnivorous sort, and leftover ham is just peachy in this dish. You can either mix it in to the carnivores’ portions, or simply top theirs. Either way, the vegans are happy and the carnivores are happy and everyone’s happy. 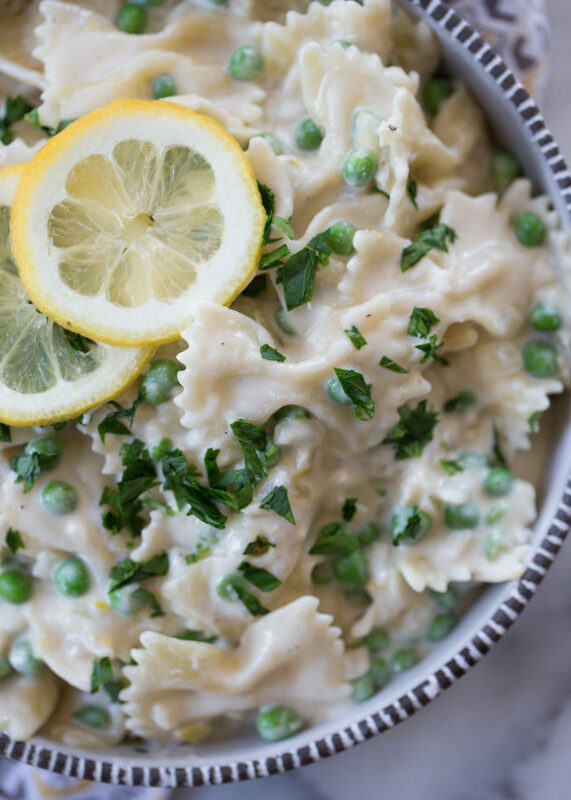 Plus: lemon and summery-ness and carbs and all good things! If using cashews, place them in bowl and cover with boiling water. Let soak for at least 15 minutes. While the cashews soak, cook the pasta and prep the sauce. Cook the pasta according to package directions and drain, being sure to reserve 1 cup of the pasta water. Set a large heavy skillet over low heat and add the olive oil. When hot, add the onions. Sweat the onions on low heat (they should barely sizzle) until tender but not browned, 10-12 minutes. Add the garlic and cook, stirring occasionally, for another minute. Stir in the wine, lemon juice, lemon zest, salt, and pepper. Increase heat to medium. Cook, stirring occasionally, until the liquid has mostly evaporated, about 3 minutes. Meanwhile, drain the soaked cashews. Blend in a high-speed blender with 1/2 cup water until smooth. Pour into the skillet along with half of the pasta water. 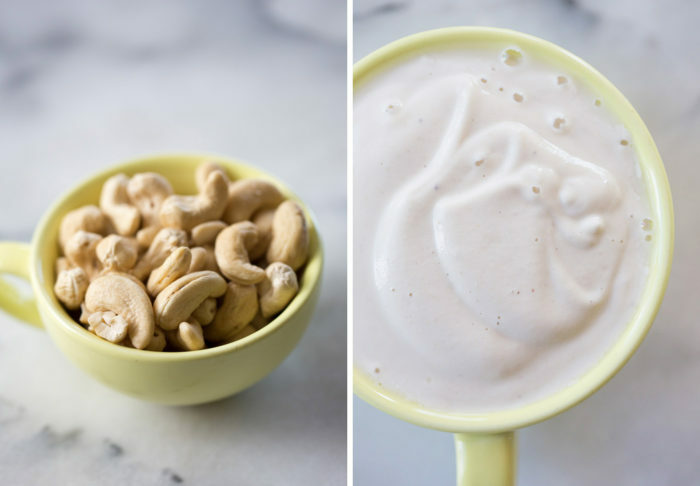 (If you’re using heavy whipping cream instead of cashews, add that now). Stir until warmed through and bubbly. Reduce heat to low. Add the cooked pasta and the peas. Stir gently until the pasta is coated. Add additional pasta water as needed to make sure the sauce coats all of the pasta. Transfer to serving bowl and top with parsley. Divide the pasta and stir ham into the carnivores’ portions, or you can just top their pasta with the ham. Add 1/4 cup of cubed ham per serving. 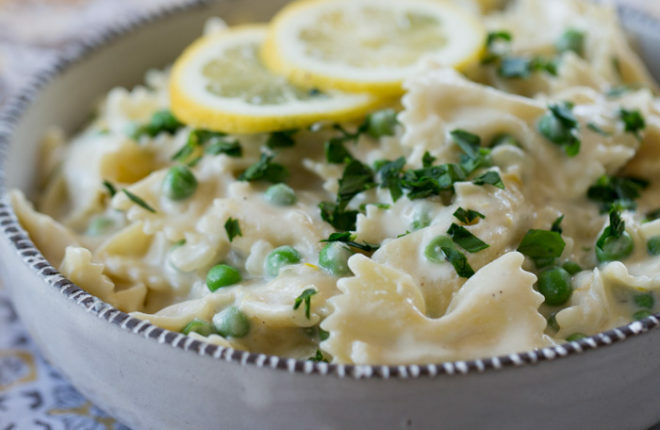 Use heavy whipping cream instead of cashew cream, and you may also want to pass the Parmesan at the table. Use your favorite gluten-free pasta. Made this today & followed the recipe to the letter – excellent. Thanks! My husband and I loved this recipe! 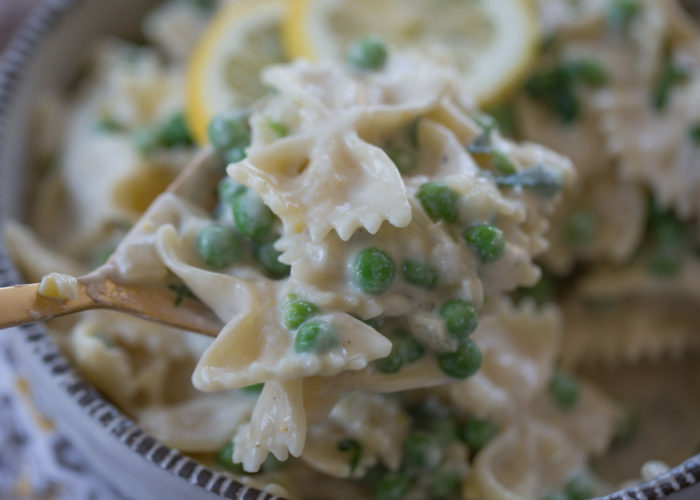 I’m always looking for creative vegan pasta recipes, and am so glad I stumbled upon your website. We’re mostly vegan (always when at home) and happened to have some leftover cashew cream in the fridge from Christmas, which made this recipe that much quicker and easier. I used 1.5 shallots instead of onion, and didn’t have any veggie broth on hand so I added an additional tablespoon of earth balance butter and a bit of olive oil (I used the butter to saute the shallot and garlic instead of olive oil, for flavor). I’m excited to search through your website for more quick and easy vegan (or veganizable) recipes! Thank you!! !